Surprise! Once again Dionysus Records has once again convinced me to do an extra installment of the Freaky Tiki Surf-ari. The label’s upcoming vinyl (and digital download) release of This is Boss! The lack of any obvious horror content, not counting the band’s executioner hoods, was a hard sell for me but it was enough to warrant a look into their previous albums. Thank goodness for that, because I liked what I found! The Hang-Ten Hangmen’s discography is filled with plenty of horror and sci-fi content, in addition to awesome energetic music and original spoken word segments. Said segments are often so incredibly produced and authentically written that I actually had to double check to see whether or not a few were samples from other works! So after talking with both the label and the band, I’m ready to close off summer with a double album review! The Hang-Ten Hangmen’s origins can be traced to Canada in 2010. Vancouver, to be precise. 2010 also saw the release of their albums Terror Tube/Death Rattle/Beyond Damascus, Surfin’ & Swingin’ with The Hang-Ten Hangmen and the futuristic concept album Surf Banned! 2011 saw the release of more EPs and 2012 brought their first full album, Slaughter Beach Party. Naturally even more releases have been produced since then. In addition to being the house band for a Polynesian restaurant called “The Shameful Tiki Room,” the band has performed at Tiki Oasis and done their fair share touring. I should note how this might not be the same lineup heard on the first album I’ll be reviewing, Live at the Shameful Tiki. 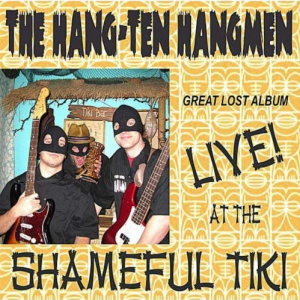 The cover art for that release, Tales of the Hang-Ten Hangmen and Surf Banned only depict three members while their first two albums show four members. The above list of members came from the 2016 release Destination Saturn, which seems to have come out after the group’s call for a new drummer that year. Although we hear some audience chatter at the beginning of “Zombie Stomp,” the opening drum beats and guitar work quickly captivate the previously distracted crowd. Although I admittedly can’t tell if it’s the audience or the band who occasionally yells “Yay!” at times. It’s a very moody track and the live nature of the recording provides an interesting audio effect. Speaking of effects, the musical one which closes the album is amazing. The soft cry for brains was a great touch as well! The drums which kick off “Jungle Sunrise” sound exactly like something you’d hear in an old Tarzan movie. The reverb on the guitars has an especially “exotic” feel which helps create the sense of trudging through a dense jungle. The surprise appearance by a tambourine also goes well with the vaguely “Middle Eastern” guitars. This track never settles on anything for too long and that’s not bad at all! The speedy and steady “Attack of the Trophy Wives” has a great buildup using drums, guitars and cymbals while “Cactus Alley” nails the feel of an old western. This is due to both the mood created by the guitar work and the other musical touches you’ll recognize upon hearing this. It’s faster than other western-inspired tracks I’ve heard, but that’s not a bad thing. It, like the other performances on Live at the Shameful Tiki, deserves all the applause it receives. Jumping ahead to 2018, This is Boss! will mark the both the band’s first full vinyl album and their first “Hi-Fi” release! “Back Alley Rumble” is a tribute to the famous Link Wray track and has a rollicking feel which suits the title. As always, the guitar and percussion work are amazing and help make this an incredibly introduction to the album. It’s easy to imagine a bunch of stereotypical 50’s greasers cruising around town to this song. The title track, “This is Boss,” also references the 1950’s. In this case, it’s how “boss” was slang for “great” back then. The heavy percussion and reverbing guitars provide lots of power and plenty of variations. Although drums are the clear star here, the “This! Is! Boss!” chant was a great touch. “Electro-Matic Twist” provides a somewhat eerie feel to the opening “coo” before blasting into guitars, saxophone work, clanging percussion and sizzling snares. The interesting guitar work makes this a personal favorite. “The Wind and the Sea” is dead-on perfect tribute to spaghetti westerns thanks to the moody plucking. Although I’ve never heard a saxophone in a western track before, consider me converted as to wanting more bands to do so! I also enjoyed the nifty touches of vocals. Could it be that the band’s doing multiple western songs could be a reference to the appearance of hangings in such movies? Or maybe it’s just because spaghetti westerns had amazing soundtracks. “Beer Can” features an appearance by Mark “Malibu” Sanders of Mark Malibu & the Wasagas fame. It’s a real head bopper whose speedy opening and sax work layered in the background also bring the 1950’s to mind. Although the clapping hands might not be 50’s enough for some, I thought they were a welcome touch. The peppy yet smooth “Sunset Strip” sounds like what you would hear in a driving montage from a vintage movie. It also features plenty of clapping hands and flows nicely into the next track, “Yeah!” However, that track quickly revs up to the pace we expect from the Hang-Ten Hangmen. The saxophone gets the spotlight, although the guitars do deserve some praise for having reverb which practically says “Yeah!” It would have been easy to just have someone say it, but it takes true talent and imagination to pull off something like that. “Boogaloo” combines jingle bells and super sweet guitars. Although the bells come and go, I think the other instruments still carry a feeling of holiday cheer. “The Incredible Hip Shaker” lives up to its name thanks to its expert use of the combination of instruments we’ve come to love over the course of the album. Then the Hang-Ten Hangmen surprise us with some expert organ work and drums which might remind you of rolling waves. The organ returns for “Last Day of Business,” which has a softer and more restrained pace than the previous tracks. Not that this is a bad thing, mind you. “The Big Beat” picks things back up for the big finish. There’s plenty of shaking maracas and touches of vocals, along with what appears to be a crackling Northwest Airlines ad sample. If this was actually an original creation, then they did an incredible simulation despite my personally feeling it doesn’t fit in with the rest of the track. But if it’s an actual sample, then I think this is a creative step backwards for the band. The best comparison I can think of to describe my opinion is a restaurant who used to make gourmet quality meals with fresh ingredients suddenly adding portions of reheated TV dinners into their specials. 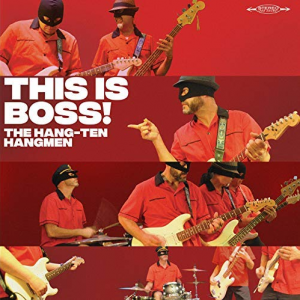 My complaint about one aspect of the final track aside, the music of the Hang-Ten Hangmen is not to be missed and the album lives up to its name. This is Boss! is scheduled for release in October, so try to keep that in mind while reading the upcoming Halloween countdown. They have plenty of other affordable albums to enjoy while you wait, so consider the albums reviewed in this article as the tip of the iceberg. Hopefully the Hang-Ten Hangmen will continue to be prolific when it comes to new releases! Special thanks to the Hang-Ten Hangmen and Dionysus Records for use of the images!